You're saying to ignore a trend of only two years because it doesn't count in the face of a trend of only two years immediately prior. Those two years are the aberration - in case you hadn't noticed, CO2 emissions have increased every year since about 1860, with the odd exception. Next up, pedestrian crossings are black on white, not white on black. Whether the EU has reduced emissions means sweet FA if the rest of the world is increasing by more than those reductions. And Bolsinaro hasn't even started on the Amazon yet. The only thing you got right is that recessions have more impact on emissions than any promises or overt action. Well done! I did. I explained the basic fact that economics vary and thus CO2 emissions vary. There are economic boom and bust cycles. There are recessions. There are changes in governmental policies. There are changes n consumer patterns. An economist could probably come up with more reasons why economics varies. I did not say ignore the last 2 years. I said they need to be included in a longer tern trend to smooth out economic variation. This is similar to solar variation. No one ignores the fact that the Sun has a 11 year cycle when looking at trends in global temperatures. We use the last > 11 years including the last 2 years of solar activity to calculate the current trend. 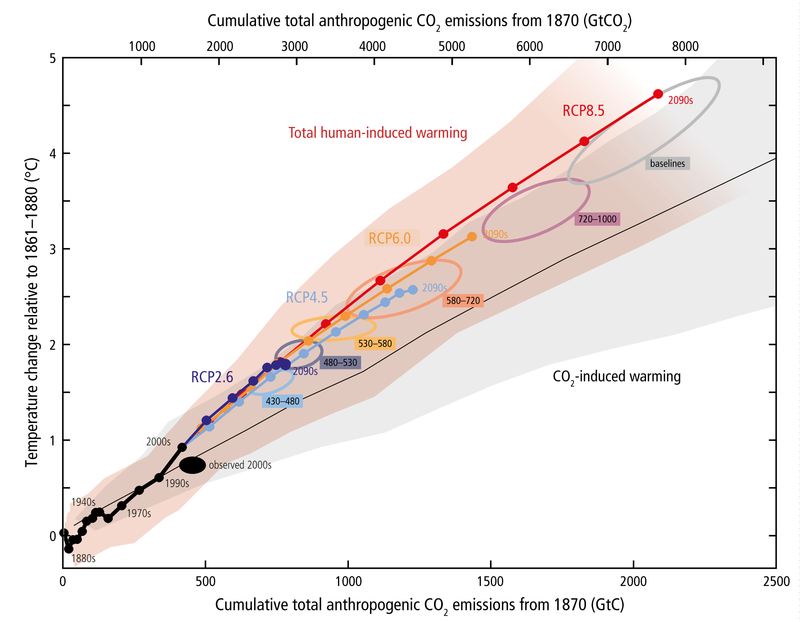 ETA: We cannot reliably use just 2 years rise to predict future CO2 emissions will rise at the same rate. There is a chance that emissions will return to a plateau as previously. The EU and other countries decreasing their CO2 emission merely suggests that countries such as the USA, China and India could do the same. Last edited by Reality Check; 25th March 2019 at 07:43 PM. That is not quite what that news article says, The Atheist. This is an article about greenhouse gas emissions from energy production, e.g. coal-fired power plants. They are not the only source of our CO2. There is no mention of global GDP in the article. There is a "2.3% increase globally" in general energy demand with no breakdown into sectors. That figure alone is below global GDP of 3.5% (2017) AND 3.6% (2018). And given that the "plateau" itself consists of 2-3 years in a trend of 175 years, you're refuting your own point. Yet again, but for god's sake don't admit that. Yes, there's a chance they will slow again. There's also a chance they won't. I think the latter is more likely. Give it five years and we'll know what they were, but given the long-term trend, world GDP growth and the fact that the "plateau" was very short-lived, I'd gladly bet a box of chocolate fish on it. EVERY country COULD cut its carbon emissions, but it's not helluva likely in the three you mention. For god's sake, it was only last year a mass of Chinese factories were busted releasing CFCs. And still are, for that matter. India won't slow its growth, which is what lowering carbon emissions would mean, and if you bothered checking out the bloke who's living in the White House and the people he's appointing to posts that impact on climate, you'd laugh at the idea that America is going to reduce emissions until it becomes financially imperative. That's a decade away at least. You are aware USA withdrew from Paris, aren't you? Do you even recognise how much easier it is for highly matured economies to go green than developing ones? I love the way your name doesn't reflect your ability to acknowledge reality. Nice irony. Correct, which is why I pointed out how similar they were. But there's an excellent example in your post that shows what I mean about reality - what the sector breakdown of CO2 emissions are is utterly irrelevant when discussing the increase overall. Yet you raise it as though an important piece of the puzzle is missing. I'm trying to figure out what you're trying to disagree with here, and I don't think you even know yourself. My point is that you did not use that 175 years of data! ! My point is that the existence of countries who have reduced CO2 emissions such as the EU means it is physically possible for the USA, China and India to reduce their CO2 emissions. Whether it happens is a different matter. The politics are irrelevant for this thread. My points are that global GDP (3.5% in 2017, 3.6% in 2018) are numbers that are not similar to a "2.3% increase globally" in general energy demand. 2.3% is not close to 3.6%. When numbers are reported without errors, the error is generally +/- 1 in the last significant digit, i.e. 2.3 +/- 0.1 and 3.6 +/- 0.1. The energy demand is not just fossil fueled energy demand. Energy demand includes solar and wind power. Energy demand includes hydroelectric power. Energy demand includes nuclear power. Fossil fueled energy demand will be less than 2.3%. A percentage increase (2.3%) is not an annual measure (3.5% in 2017, 3.6% in 2018). The percentage increase in global GDP between 2017 and 2019 was 0.1%. Earth's Polar Cell is breaking up. On Tuesday, Klawock, Alaska topped out at 70 degrees Fahrenheit. Note the cold areas on the right side of the image. Last edited by Warmer1; 26th March 2019 at 09:39 PM. For comparison, that was 4o C (9o F) warmer than NZ's southernmost city, Invercargill, which is 10 degrees of latitude closer to the equator than Klawock. Not a good comparison because Invercargill is different from Klawock. Invercargill is at the bottom of the South island with Stewart Island below it. Invercargill is partially shielded by Stewart Island from cold southerlies but subject to weather funneled between the islands. Invercargill has the high ranges of the Southern Alps to the north. Klawock is on the coast of a continent. Klawock is shielded by many islands (it is almost an inland city). There are at least hills all around Klawock. The weather will be different from Invercargill. A more appropriate comparison of weather would be a South American city. Wow, no wonder you use that name - you figured out they're different places. Pity you had to use Wikipedia to find out, but that's how it goes, I guess. You really ought to see if you can go and buy a yourself a personality & sense of humour one of these days - I was making a casual observation rather than a scientific comparison. This is a discussion board as far as I'm aware, and your Romney-like blethering is both tedious and irrelevant. p.s. I've added a few links so you don't get lost in the plain English. Sadly, you are probably being overly optimistic. The IPCC “business as usual” scenario where we don’t start to reduce CO2 emissions at some point places warming by 2100 between ~4-6 deg C above pre-industrial (1900ish) levels. Any projection lower than this includes at least some reduction in CO2 emissions. Sadly, you are probably being overly optimistic. More than likely, but I try to look on the bright side. Economic pressure + insurance premiums rising sharply will force change. Whether it's soon enough to matter is anyone's guess. What cuts off CO2 emissions and saves us will probably end up being economic and social collapse. You were the one who causally compared weather in different places without checking whether their weather is different due to their different terrain! Insults do not make a casual comparison correct. A "scientific comparison" assertion about my post pointing out that the casual comparison is wrong does not make the comparison correct. I have the advantage of living in NZ and already knowing that Invercargill is a coastal city at the bottom of the South Island, sandwiched between Stewart Island and the Southern Alps. So I looked up Klawock and saw that it is a city on an large island (Prince of Wales) surrounded by islands and at least hilly terrain according to Google Earth. Different terrain alone makes the comparison wrong. Last edited by Reality Check; 3rd April 2019 at 05:07 PM. Your dishonesty is becoming worse by the day. Typically, you're defending yourself against a strawman of your own making. A real David Seymour moment, well done. Insult, repeating a foolish comparison and seasons ignorance? Insults and repeating a foolish comparison, The Atheist. You compare have cities in different terrains I did not point this out before but your comparison is also ignorant about seasons. Invercargill is in the Southern Hemisphere and starting autumn. Klawock is in the Northern Hemisphere and starting spring. Invercargill coming out of summer and being warmer than Klawock coming out of winter is not a surprise. Another tiny flaw with the comparison is choosing the southernmost city in New Zealand when Klawock is not the northernmost city in North America. Invercargill coming out of summer and being warmer than Klawock coming out of winter is not a surprise. Finally, absolute proof you have no idea what you're even arguing about. You're dead right, Invercargill is usually warmer than Klawock at this time of year. You know, your continual following me around threads and making incorrect or spurious points is verging on stalking, and this thread proves it - you haven't got the least idea what you're crying about, but you have some strange compulsion to challenge my posts to the extent that you're making strawmen and outright lying. Like I said earlier - it is truly pathetic. Meanwhile, in actual climate news, this struck me as pretty funny. Trump disbanded them, but can't shut them up. Rather irresponsible politics is countered by responsible people reforming a scientific advisory group to complete the work it would have finished for the federal government. The Advisory Committee for the Sustained National Climate Assessment was established under Barrack Obama's administration to provide scientific guidance based on the 4 yearly National Climate Assessment. A weak excuse to not renew their charter was that there was only 1 industry representative. The administration was not willing wait until April 2018 when advisory members would be rotated off. “It’s disturbing that the Trump administration dumped a scientific advisory committee for having too many scientists,” said Center for Biological Diversity senior attorney Howard Crystal, who filed the lawsuit to obtain the Commerce records. You're dead right, Invercargill is usually warmer than Klawock at this time of year. You still do not understand the Klawock, Alaska post. Klawock, Alaska was an example of not usual weather. Earth's Polar Cell is breaking up. It is behaving differently in 2019 and has not recovered from the polar vortex split. On Tuesday, Klawock, Alaska topped out at 70 degrees Fahrenheit. That marks the earliest 70-degree Fahrenheit day ever recorded in Alaska. The previous record was set just three years ago when Klawock reached 71 degrees Fahrenheit on March 31. In comparison, many cities in the Northeast have yet to crack that mark. Oh my god, you're making yourself a bigger fool that ever. That's the exact point I was making. Writing it again with links and bolding doesn't get you a pass here - you've demonstrated time and time again you have no idea what you're typing, and you've just done it again! For god's sake will you please figure out what you actually think, then check what I actually typed. This is so far beyond absurd it isn't even parody. You contradict yourself, you try to contradict me by repeating what I've typed. You just do not have a single clue.